I took measurements of all sides of the box, then I cut paper in these sizes and covered the box inside and outside. I prefer to use liquid glue to adhere the paper to the wood. 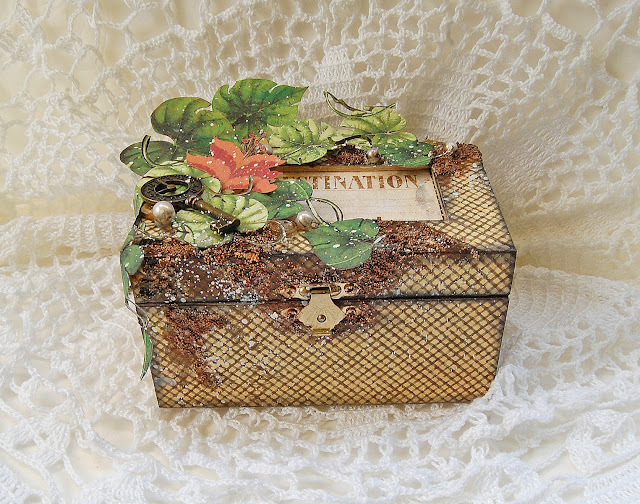 Once the box was covered, I distressed with a sponge all the edges with the Color Box decades ink to achieve the vintage look. I cut out some leaves and flowers from the papers to decorate the top of the box. I paste some of the leaves using the 3D foam tape, it gives a realistic effect. When I open the box the shelf comes out and it’s being held by chains. I decorated the shelf with various leaves and I also incorporated chipboard and sticker. I mixed colors like black, greens, browns with a touch of orange and I love how they look together and to make it more interesting I added textures with mini art stones. I gave a rusty effect to the stones with a copper paint.